I arrived in Fethard too late to visit the castle, or so I thought. The south gate that leads to the medieval graveyard, in which the castle stands was closed. I have since learnt that access to Holy Trinity medieval church and graveyard is actually from the northside. The castle is privately owned, but hopefully I will find out if it's possible to visit the interior on my next visit to Fethard. 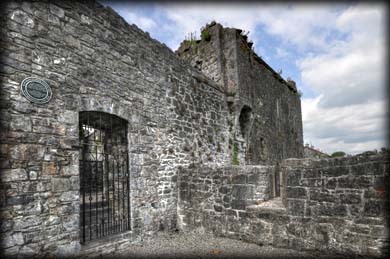 Originally the south wall of the town turned north at the castle, which suggests the castle was built onto the wall at a later date. Known locally as Edmonds castle it may have been part of the abbey's domestic buildings. Situated: From Cashel take the R692 ESE for about 16.5 kilometres. Then turn left onto the R689. 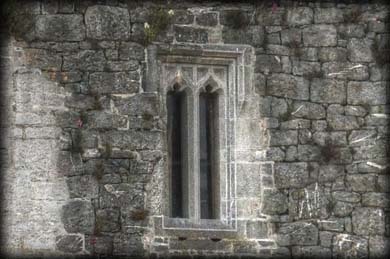 The castle is built onto the south wall of the town in the SE angle of the medieval churchyard. Discovery Map: 67 S 2078 3492. Last visit June 2015.